For fun in the sun without the worry of damaging little one. 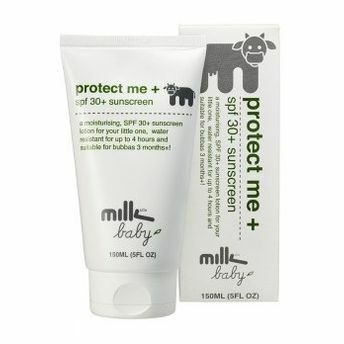 Protect Me + SPF 30+ Sunscreen is water resistant for up to 4 hours and suitable for babies 3 months+. It is a unique formulation, free of chemical absorbers, that provides a broad spectrum of coverage. It's active ingredient is zinc oxide. Research shows that zinc oxide-based sunscreens provide the best coverage against the sun's UVA and UVB rays, whilst being the least harsh on our skin. With vitamin E and aloe vera, if only the best will do, then Protect Me + Sunscreen is the sunscreen for you. The Protect Me + Sunscreen is also free of chemical absorbers, which makes it suitable for sensitive skin, young children and every day use. This product is SPF 30+ and 4 hours water resistant, which makes it ideal for your little ones that love the water or are playing outdoor sports. The Protect Me + Sunscreen contains aloe vera, vitamin E and calendula, which provide moisture and soothe the skin. Explore the entire range of Creams, Lotions & Oils available on Nykaa. Shop more Milk & Co. products here.You can browse through the complete world of Milk & Co. Creams, Lotions & Oils .